Time for a pop quiz. Quick, who died (almost exactly) 100 years ago? No, don’t peek at Wikipedia. Yes, Karl May, and 2012 is Karl May Year. On 30 March 1912, just days before the Titanic set sail from Southampton on its maiden voyage, Karl May died in Radebeul near Dresden, Germany, at the age of 70.
for his aim and his all-powerful fist, and for his friendship with Hadschi Halef Omar, his Muslim guide, and with all natives suffering under Ottoman rule; and, as a light encore, a few tales set in Latin America. Orient late in life helped to shore up his knowledge of the regions after the fact, but scandal followed him throughout his writing career, up to his last days, which included a dreadful marital imbroglio. A learned and very readable recent biography (only in German, alas), Helmut Schmiedt, Karl May oder die Macht der Phantasie: Eine Biographie (Munich: C.H. Beck, 2011), reflects on the writer’s apparent megalomania and the final transformation of his self-image into that of a Christ-like savior preaching world peace in those tense days leading up to the Great War. It is hard to decide whether he had not come to believe his own legend. I certainly believed it. The books not only “felt” authentic: they came with a brief editorial comment about “Dr. May”’s travels, a terse but straightforward timeline (“this story occurred between 1860 and 1870”), and a map. How I loved those maps, with all the thrilling, exotic names (New Orleans, San Francisco, Llano Estacado, Cairo, Rio de la Plata, Kurdistan), a sinuous route that by its very shape evoked an exciting venture, swirling mountain roads, perilous desert trails—and all more or less in the right places! True, by the end of the series, when I was perhaps eleven or so, it did occur to me that May had traveled an awful lot in a short time, and my budding sense of time and place was jarred a little when Winnetou—in what otherwise seemed a masterstroke of imaginative as well as economic plotting—joined Old Shatterhand Kara ben Nemsi in the Sahara for Winnetou and the Bedouins (Orig. title: Krüger Bei and Satan und Ischariot), but then there were these maps! How could this not be true?! Curiously, it was May’s ardent patriotism that did him in for me. Eventually I grew weary of the fact that virtually every hero of the West (and to some extent of the East), every famous scout whom Old Shatterhand encountered was, like him, German, or more accurately, from Saxony. Or alternatively from Pommern. (No slackers from Bavaria admitted here!) This, I thought, defied credibility, and I have been a skeptic of nationalist feelings ever since. And yet, and yet: I credit May with instilling in me at a very young age an interest in the world, in other people’s experiences, in learning about their history. I learned about the Mahdi (In the Land of the Mahdi, set against the backdrop of Muhammad Ahmad‘s 1881 rebellion along the Nile) years before I read anything “serious” on Islam or African history; indeed, my knowledge of Ottoman history—such as it is—still owes a lot to From Bagdad to Istanbul and Through Wild Kurdistan, with a little help from Seven Pillars of Wisdom years after that. Ich hoffe nur, ich find sie bald. Hat schon so lange nicht mehr geknallt. Perhaps the most spectacular product of the Karl May industry was the series of seventeen (17!) German westerns and easterns produced between 1962 and 1968, mostly featuring the striking Pierre Brice as Winnetou and the Hollywood actor Lex Barker, Johnny Weissmuller’s successor in the Tarzan role, whose 6’4” frame made him the ideal Old Shatterhand / Kara ben Nemsi. Yes, American readers: before Sergio Leone and his Spaghetti Westerns, there were Frankfurter Westerns. In fact, some of the latter even introduced actors who became stars in the former, like Terence Hill and Klaus Kinski. And they had Herbert Lom. I just found out that Dartmouth’s media library owns a videotape of The Shoot (“Der Schut”), the 1964 film based on May’s story of the same title involving Kara ben Nemsi’s pursuit of a villain in the mountains of Montenegro/Albania, “somewhere between 1860 and 1870”. We probably owe that to Gerd Gemünden, my colleague in the German department, who is an expert on German film and has published on the East German, anti-capitalist Indianerfilme, and to the late Susanne Zantop. Dartmouth students, what treasures do you have right here at your fingertips! 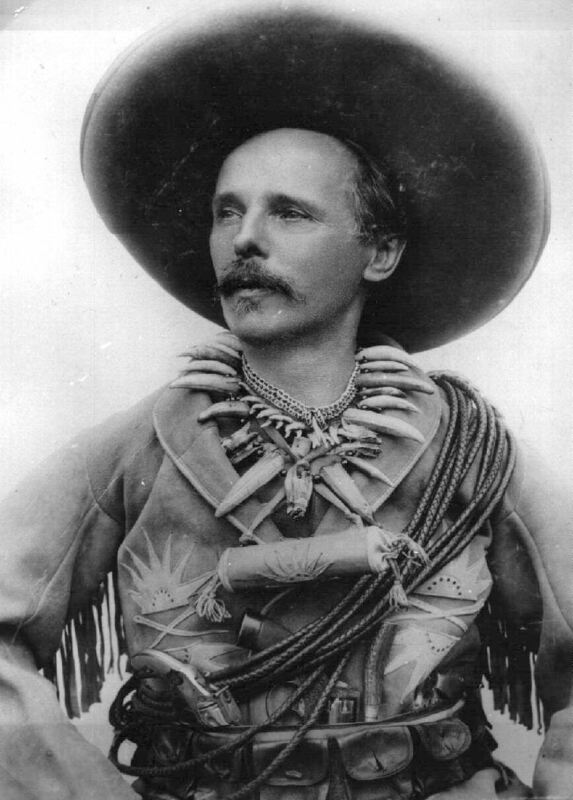 Update: The German Karl May Jahr site announces an American exhibit on May opening in..uh, May. At the Apache Spirit Ranch in Tombstone, Arizona. That looks like the right place for it. This entry was posted in Books, idle dreams, May, Karl by Walter Simons. Bookmark the permalink. My wife has a German copy of Halbblut – I had no idea that May was once so popular and influential. One of the stereotypes of Germans is that they are fascinated with the American West and its Native American culture in particular – if this is indeed true, do we owe this to May? Maybe you can take a look at Christian C. Feest, “Germany’s Indians in a European Perspective,” in Colin G. Calloway, Gerd Gemünden, and Susanne Zantop, eds., Germans and Indians: Fantasies, Encounters, Projections (Lincoln and London: University of Nebraska Press, 2002), 25–43, who doubts German exceptionalism in this matter, finding that German interest in native Americans generally follows a common, European pattern, the only difference being that the German phenomenon has been studied more, or has been mediatized more prominently, in no small part because of Karl May; or Susanne Zantop’s “Close Encounters: Deutsche and Indianer,” in the same collection (pp. 3–14), summarizing the other essays there and similarly questioning the stereotype. There is also Ter Ellingson, The Myth of the Noble Savage (Berkeley and Los Angeles: University of California Press, 2001), who examines Anglo-American anthropological writing of the nineteenth century (but does not consider May, or Germany). seems to have quite a collection of the English translations of May’s original work, it might be worth looking into for anyone not able to read German, but wanting to read May’s work in English.